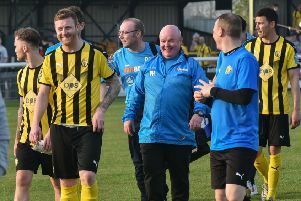 Paul Holleran declared himself satisfied as Leamington negotiated another tricky hurdle to ramp up their pursuit of Chippenham Town at the top of the Evostik Southern League Premier Division, writes Paul Edwards. Brakes continued their relentless pursuit with a seventh win from eight games and yet another clean sheet as Town became the latest team to be fail to get a single shot on goal over the 90 minutes. Leamington opened the game at pace and fully asserted themselves inside the opening ten minutes, backed by a raucous travelling support who made full use of the excellent acoustics on the terraces. Jack Edwards was somewhat dubiously adjudged to be offside as he powered home a header from a dangerous free-kick into the Basingstoke penalty area after three minutes, but this was rapidly forgotten as in their next attack Courtney Baker-Richardson won the ball in a scramble in the box following another free-kick, giving Ahmed Obeng the opportunity to stab a low shot into the net. It quickly got even better, the lead being extended with just ten minutes played. Great closing down by Edwards forced Marcus Johnson-Schuster to give the ball away, allowing Rob Thompson-Brown to pick up possession, cut inside and crash a fizzing low drive beyond Alex Tokarczyk and into the bottom corner for his third goal of the week. Johnson-Schuster found space on the right wing to set up Aaron Jarvis who shot wide from a good position, while his strike partner Michael Atkinson was left in acres of space down the left but instead of shooting tried to play the ball across goal and it drifted harmlessly wide. The Dragons looked like they might pose a threat as they broke forward at pace but they seemed to run out of ideas in the final third and came up against a defence which is now back to its usual watertight self after the home calamity against Slough at the end of January. In truth there were few clear-cut opportunities for Leamington after their bright opening spell, but they rarely looked threatened and were able to see out the game to collect another vital three points. Obeng had a shot blocked by Joe Gater, while Baker-Richardson’s attempted lob dropped over as he spotted keeper Tokarczyk off his line. The hosts then rippled the side netting with a free-kick from Sam Deadfield. The closest either side came to a goal in the second half was when Edwards flashed a header from a corner across goal and just wide. Terence Van Cooten cracked a decent effort just over the bar for the hosts towards the end, but Brakes were well worth their victory and can now regroup with a free midweek before welcoming Dunstable Town to the Phillips 66 Community Stadium on Saturday. Holleran admitted he had been concerned about this fixture due to the heavy schedule prior to it, but was pleased with the way his team applied themselves. “Basingstoke play a possession-based game and are very good at it, which means you spend a lot of time without the ball, so we’ve had to work really hard at that today. “We got off to a fantastic start and could have gone further ahead in the opening 15 minutes. “We haven’t got too many options at the moment with a few little niggles but we managed the game well defensively and limited the home side to not one shot on target, so that side of our game was spot on. The Leamington boss reserved further praise for Thompson-Brown, saying: “He’s scored another super goal, his work ethic and application was tremendous today. Basingstoke: Alex Tokarczyk, Marcus Johnson-Schuster, Terence Van Cooten, Dan Collier, Joe Gater (Nana Owusu, 59), David Ray, Sam Deadfield, Charlie Kennedy, Aaron Jarvis, Michael Atkinson, Ashleigh Artwell (Oluwatobi Adekunle, 67). Subs not used: Kieren Greene, William Shaw, Ross McKernan. brakes: Tony Breeden, Richard Taundry, Tom James, Darren Pond, Jamie Hood, James Mace, Courtney Baker-Richardson, Callum Gittings (Jordan Goddard, 59), Ahmed Obeng (Ben George, 88), Jack Edwards, Rob Thompson-Brown (Richard Gregory, 78). Subs not used: Joe Magunda, Connor Gudger.